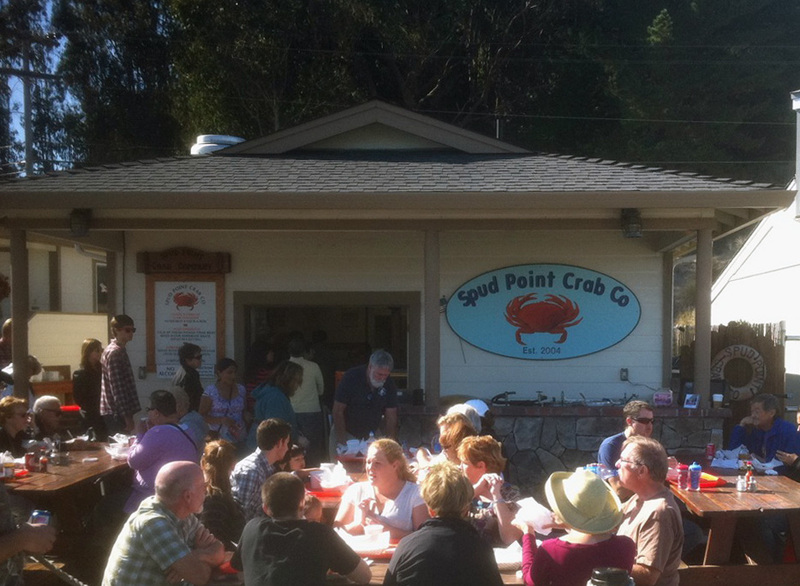 Good eats at the Spud Point Crab Company. Located across the street from the Bodega Bay commercial fishing fleet, and family owned and operated since 2004 this out-of-the-way, parking-challenged, hope the weather is decent cuz the picnic tables are outside or you’re takin’ food to go hole-in-the-wall serves up the best Fresh Crab Sandwich on a toasted bun I have ever eaten! Plump, juicy and piled high, light on the mayo, and not a leaf of lettuce in sight, or fillers like chopped celery—the true flavor of all that crab comes through loud and clear. Warning: This sandwich is smallish; enough for one but not enough to share unless you buy another (shrimp?) or add an order of the Crab Cakes. But that’s not what the place is known for. At least not with the locals and those in the know about Spud Point Crab Company. It’s all about the Clam Chowder. They serve both versions, Manhattan (red) and New England (white). Personally, I believe the New England variety is the bomb. So on my first visit, I shared a pint container with my husband; served with plastic spoons (who needs a real bowl?) and a bag of tasty seasoned oyster crackers. Although it is chock full of fresh clams, and served piping hot, we both found the soup tasted too garlicky. You may not. Many folks say it’s better than the clam chowder you can get in Boston! I’ve had chowder there too, and find it more to my liking. Maybe it’s because in Boston they add bacon, and go easy on the garlic? You be the judge on your visit, and don’t forget about the Crab Cakes (served Sat & Sun only—while they last). Yummy. Tri-Tip sandwiches, hot dogs and chili are also available, but why go out of your way or waste a visit for that unless you live in the area? Go for the crab baby!